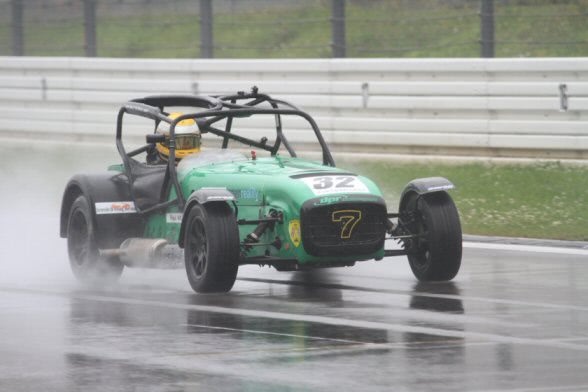 The aptly named Caterham Eurofest rapidly became a DPRfest as DPR customers gained podium results across the three team-supported championships. DPR customers gained the best team results in Superlight, 5 out of the top 8 places in Tracksport and 4 out of the 6 podium places in Supersport. The Superlight races were dominated by DPR driver Paul Wilson with a closely fought second in race one followed by a defining win in race two. 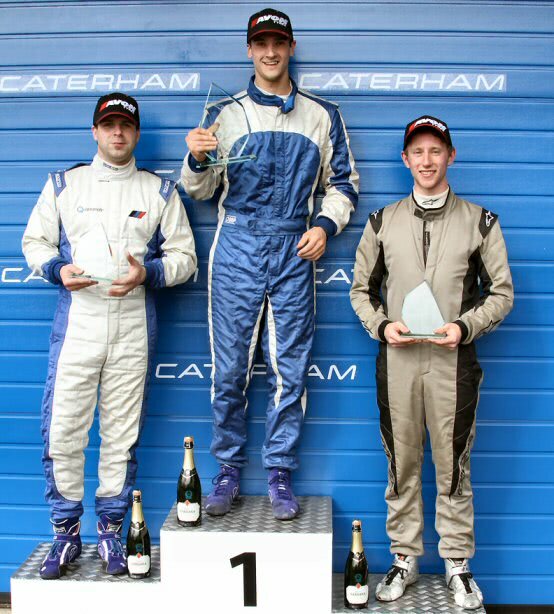 In Tracksport Stuart Leonard (1st, 3rd) and David Robinson (3rd, 2nd) had podium results in both races. Jeremy Webb (1st), Ben Whibley (2nd,3rd), and Craig Currie (2nd) all helped ensure that DPR received a similar representation in Supersport. After two days of dry testing on a hot track, full wet conditions were present for the Saturday qualifier and race. DPR driver Paul Wilson demonstrated his mastery of the challenging wet conditions. His comfortable second place result together with the fastest lap provided valuable championship points. Returning ex-champion Jon Walker gained a valuable 6th place for DPR. By way of contrast Race two saw a return to sunshine and racing took place on a hot dry track. Paul Wilson took the lead from the start demonstrating his command of the Nürburgring circuit, wet or dry, by establishing a clear lead over the following pack which he repeated after a safety car re-start. In the dry conditions, Paul Wilson was consistently the quickest man on track and finished significantly ahead of the following pack. Mark Shaw had arguably his best drive of the year recovering from his 14th place start on the grid to gain 2nd place for the closing lap. However an incident at the last chicane relegated Mark Shaw to 5th. With a near maximum score at the Nürburgring, Paul Wilson has taken the championship lead; after dropped scores Wilson’s championship position becomes even stronger. However with four races yet to take place both Mark Shaw and Ian Payne remain in contention. As a result of the championship points gained by Paul Wilson, Jon Walker and Mark Shaw, DPR gained more team points than any other Superlight team increasing the DPR lead in the team championship; the next placed team is now 92 points behind. DPR customer Jeremy Webb and Ben Whibley made it a DPR 1-2 in race one. DPR driver Craig Currie almost gained a DNF in race one courtesy an attack from behind at turn one at the start but following a strong drive from the back of the field recovered well to gain 5th place. Race Two saw Craig Currie, Jeremy Webb and Ben Whibley taking 2nd, 3rd & 4th places for DPR. With only one prior race weekend without his novice cross, DPR driver Stuart Leonard gained a stunning win in race one coupled with the fastest lap. The race was closely fought until the last lap with Leonard making a tactical late pass to cross the line in front of Terry Langley with DPR customer David Robinson taking third. DPR driver Oliver Jarrat gained a creditable 6th followed by Adam White and Kurt Brady in 7th & 8th places respectively. As a result DPR customers gained 5 out of the top 8 results in race one. Race two followed the same pattern until the leading pair of David Robinson and Terry Langley gained clean air. Stuart Leonard fought hard to gain a third behind Terry Langley and David Robinson. DPR Tracksport driver Adam White narrowly missed the podium with 4th place and with Kurt Brady 7th and Oliver Jarrat in 8th DPR customers repeated the race one outcome with 5 out of the top 8 results.